Let’s go in order of priciest brands to most affordable, shall we? For years now, people have raved about the MAC Prolongwear Concealer and I’ve never tried it because as much as people love it, it comes in a small pump bottle and people complain that it wastes too much product and/or the bottle breaks if you drop it. Tip: wrap a couple of rubber bands around your Prolongwear Concealer to buffer it from breaking in a fall. Anyways, I picked it up in shade NC35. I can understand why people say you may squeeze out too much product but I’m finding it’s not a problem as long as you press slow and gently. As far as coverage/longevity goes, I’m ambivalent. It doesn’t cover as much as Tarte Shape Tape, but it’s better than, say, Maybelline Fit Me. 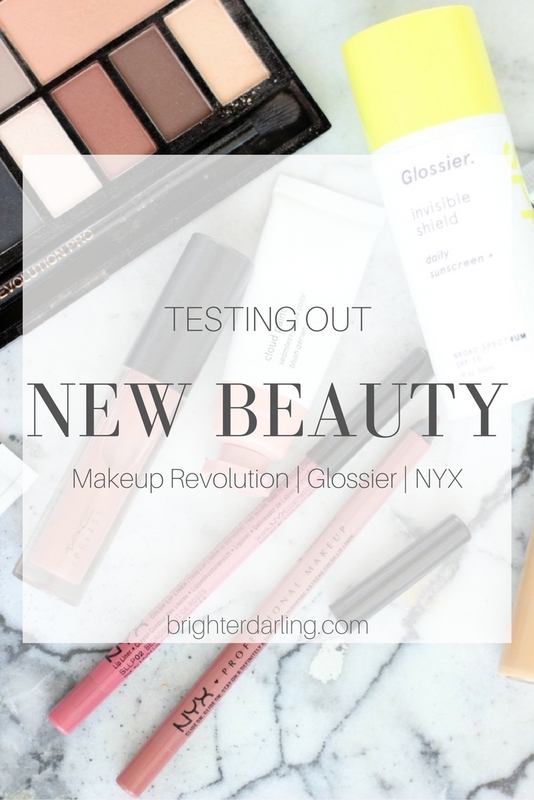 Next up is the newly repackaged (and reformulated?) MAC Lipglass. I love MAC Lipglass glosses because they are a little bit stickier which makes them last longer. I picked up shade Beaux (warm beige-brown with gold flecks). So far, I’m really LOVING this shade. It gives me just enough color on my lips without being too brown. On me, it appears more like a warm bronze beige. Perfect for summertime. I had to order a couple of the new Glossier Cloud Paints because they intrigued me so! I wasn’t sure if these would be like a cream/mousse or a stain (like BeneTint). 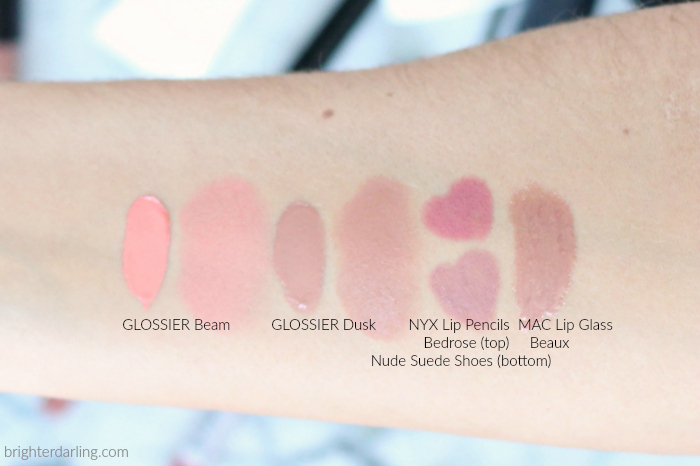 I ordered two – Beam (bright coral peach) and Dusk (muted mauve brown). These are AWESOME! I’m loving Beam a lot more than Dusk and thinking of ordering Puff (a bright baby pink). The texture is unlike any cream/liquid blush I’ve ever used. It’s like the texture of a liquid concealer. It’s not greasy at all and doesn’t add any extra hydration on my oily skin. 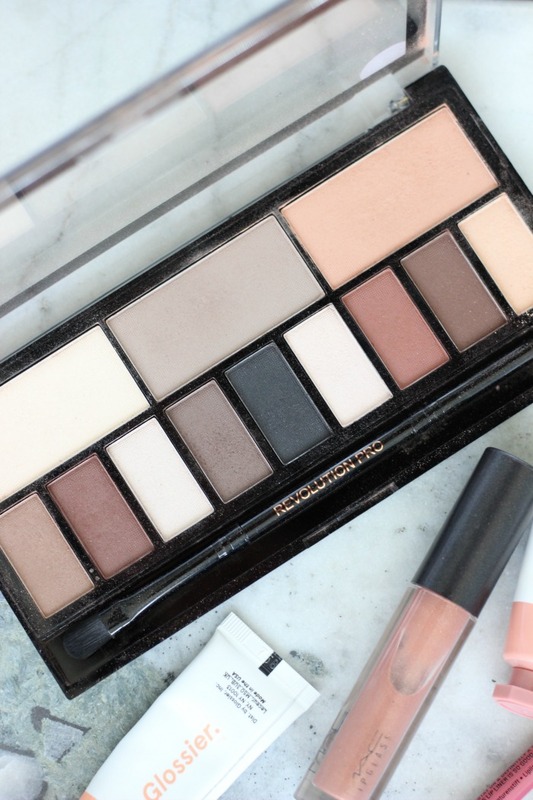 These are excellent for quick summer makeup and even for layering your powder blush on top to help it last longer. Totally recommend. Quite hesitantly, I ordered the new Glossier Invisible Shield sunscreen. It’s a bit pricey at $34 for 1 oz (not even the standard 1.7 oz you typically find). 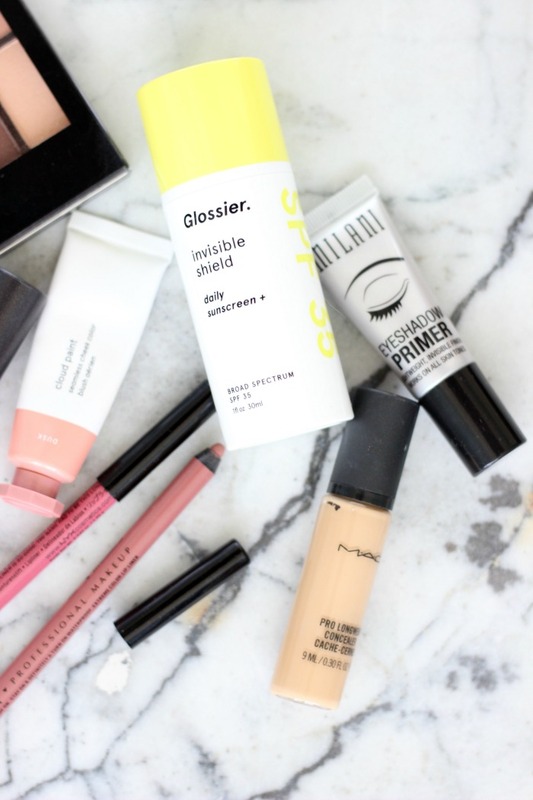 The Glossier team says you don’t need as much (hm… aren’t there sunscreen guidelines?). Anyways, my hyper-reactive skin was really wary about this formula because so many sunscreens break me out or don’t wear well under makeup. Let me just say that this watery, lightweight gel-based sunscreen works AMAZING on me. It doesn’t break me out. I can’t believe it. 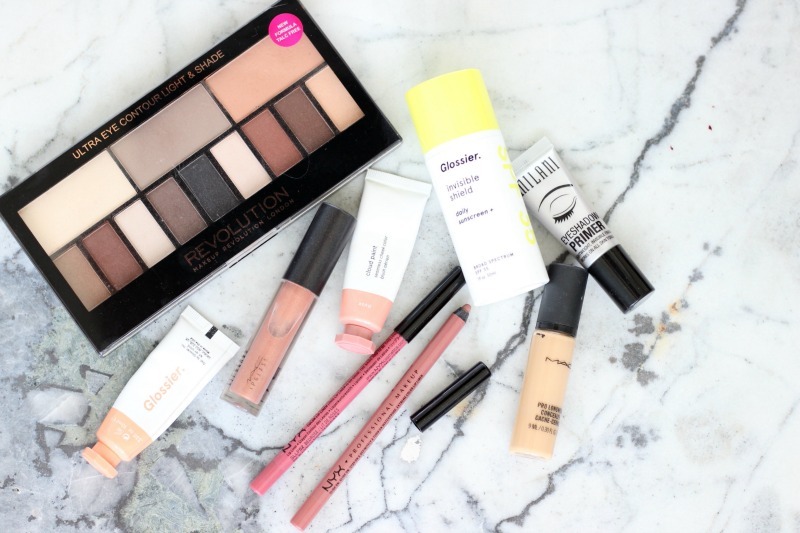 I’ll be doing an exciting “Affordable Makeup + Outfit” collab with The Jasmine Maria soon, so I picked up a few affordable makeup items to mix it up. In the past, I’ve used the Wet n Wild eyeshadow primer and it was okay. After research, I bought the Milani eyeshadow primer and it’s 100x better than the Wet n Wild one. Definitely comparable to high-end formulas like Urban Decay and even NARS. Since eyeshadow can be pretty hit/miss at the drugstore – particularly matte shades – when I saw the Kat Von D Shade Light Eye Contour Palette dupe in Makeup Revolution’s Light Shade Palette (-___-) , I knew I had to try it out. So far, the colors are about 75% as good as Kat Von D and can give you a great, quality matte eyeshadow look at a fraction of the Kat Von D palette’s price. Lastly, I took the recommendation from EmilyNoel83 on YouTube and tried the NYX Slide On Glide On Lip Liners. I’ve purchased several of the standard (black pencil) NYX lip liners and never was blown away, but Emily swore these are comparable to high-end brands because the Slide On Glide On pencils are waterproof. She’s definitely right! 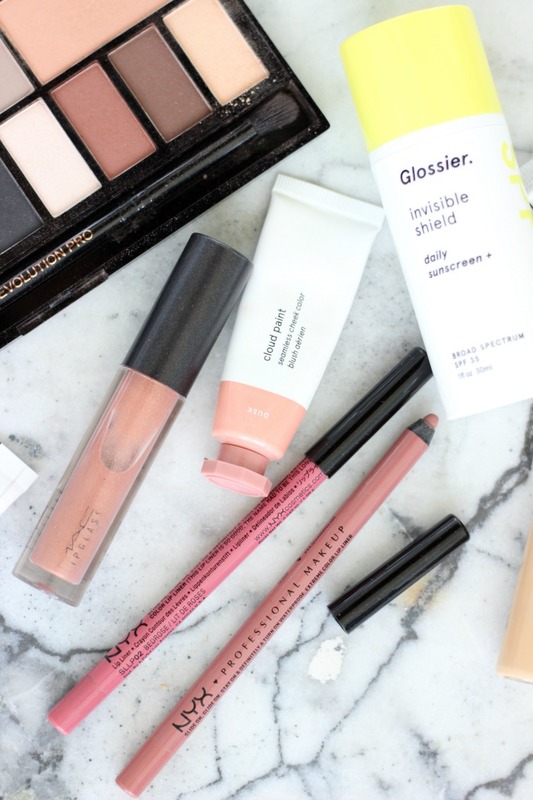 These are the best drugstore lip pencils I’ve ever tried. Loving them. "Beauty Tips From Dad: Battling Dry Skin"
"Adult Braces Update 12 | Hitting The Home Stretch!"